Join us for this edition of Spotlight on Innovation to hear from LaunchDarkly’s Heidi Waterhouse, who will share some of the biggest challenges in feature management. In a perfect world, we’d develop tidy, discrete features that are easy to manage. But in reality, we’re often struggling with a complicated snarl of features that are difficult to test and deploy. Heidi explains how you can use feature management design to build modular, testable, resilient systems—topics which we’ll also be covering at our Velocity and Software Architecture conferences this June in San Jose. O’Reilly Spotlight explores emerging business and technology topics and ideas through a series of one-hour interactive events. You’ll engage in a live conversation with experts, sharing your questions and ideas while hearing their unique perspectives, insights, fears, and predictions for the future. In every edition of Spotlight on Innovation, you’ll learn about, discuss, and debate the future. Best of all, you’ll discover what successful companies have in common and how you can follow their lead with small practical steps to transform your organization and prepare for the Next Economy. Want to learn more about how to design, build, and manage resilient systems? Attend the O’Reilly Velocity and Software Architecture Conferences in San Jose, CA, June 10–13, to get the insights you need to drive results for your business. O’Reilly online learning members receive a 25% discount when they register using promo code LEARN. You want to identify the fundamental shifts that are transforming the business landscape and customer needs and address them early. You want to learn from other businesses that have successfully transformed and found solutions to customer problems. 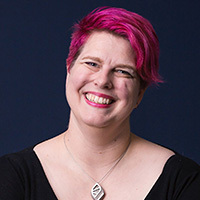 Heidi Waterhouse is a developer advocate at LaunchDarkly. She delights in working at the intersection of usability, risk reduction, and cutting-edge technology. One of her favorite hobbies is talking to developers about things they already knew but had never thought of that way before. She sews all her conference dresses so that she’s sure there's a pocket for the mic.